The only animal you start out with is your dog, who can't do any tricks and doesn't have a purpose except for companionship. As you build up your farm you can purchase livestock and poultry. Before you can purchase animals you have to build the barns they will live in. You can only build on your own land! There is a chicken coop and two sizes of livestock barns you can construct. Just go to Woody's carpenter shop and he'll let you know the lumber required and the total cost. Barns only take a day to be constructed. Once your barn is completed you can purchase animals. Visit Blue Sky Ranch and talk to Hank. You will be able to name your new animal and he'll send it off to live in your barn. The cheapest type of animal you can purchase. Inside your chicken coop will be a bin to place chicken feed, a nesting area to hatch more chickens with, and a shipping bin to place the eggs inside of. You can buy chickens from Blue Sky Ranch for 1200 G each. You only need to buy 1 chicken, as you can hatch the remaining 4 on your own. Simply take an egg and place it into the nesting box. In 7 days the egg will hatch into a baby chick, and 7 days later the baby will mature into another egg laying machine. If you want to be *really* cheap, just buy a Good Egg from Hank for 120 G and then wait for it to hatch after you put it in your nesting box. 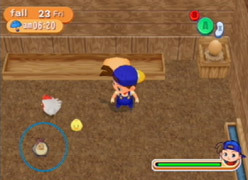 Chicken Feed is automatically stored in the coop, which you can access from a chute on the western wall. You can put the feed in the feed trough, or you can hand it directly to the chicken. Chickens like to be hand fed! Also, don't forget to feed the baby chicks. You can keep your chickens outside on sunny days, but they won't lay any eggs if you leave them there overnight. Once you've shipped an egg, Michael will have the Mayonnaise Maker for sale at his Junk Ship for 3000 G.
A baby cow costs 3500 G from Blue Sky Ranch, and takes about 2 weeks to mature. Once the cow has grown to an adult you can milk it every day. Cows are slow moving beasts and can take a while to move outside if you herd them out by using the Bell (500 G). Unlike chickens, you can leave your cows outside and still continue to receive produce, but only if you've grown some pasture grass for them to eat. You can buy the Grass Seed from Liz's shop for 50 G a bag. The grass will grow during Spring, Summer, and Fall, but go dormant in Winter. You can also cut the grass to produce Fodder. The sheep mature in half the time compared to cows and horses, and you can buy them for 2500 G. When a sheep is full grown you can clip off it's wool to ship. The wool takes 7 days to grow back. 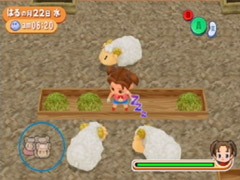 Since the sheep will be hairless during that time, it can't be entered into the Sheep Festival on Summer 29, nor can it be sprinkled with a Sheep Miracle Potion. You'll have to wait for it's wool to grow back. Just like with cows, you can leave sheep outside and still be able to collect. Just remember that you'll need mature grass for them to eat if you want to leave them out overnight. Check the weather report every day on your TV. If it's going to rain the next day, bring all of your animals back inside so they don't get a wet shower in the morning. Once you buy the Dying Pot from the Junk Shop, you can combine the wool with various herbs and flowers to make colored yarn. The colored yarn sells for a lot more than the normal versions, and you can turn any quality of yarn into it's high-profit version. 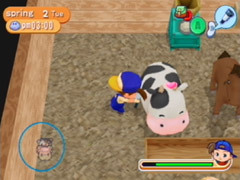 You can have as many horses as you want, unlike past Harvest Moon games where you are only allowed to keep one horse. 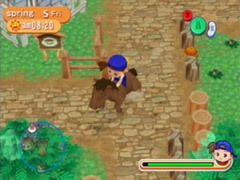 The horse is always brown colored, even though there is a blue one at the Blue Sky Ranch. The Ranch has foals for sale for 3200 G and they take almost 2 weeks to mature. One of the benefits to the horse is it's speed. If you have pampered your horse up to 2 hearts, you can ride it to speed around Flower Bud Village! Just take the horse outside, stand behind it, and press the X button. You'll jump on and ride around until you want to dismount by pressing X again. Your horse has a heart meter, but it also has a speed meter if you view the details inside of the animals menu. The more stars it has, the more training it has had. To train your horse just ride it around the village a lot. Eventually it will begin to earn stars, which makes it easier to ride during the Horse Race events. 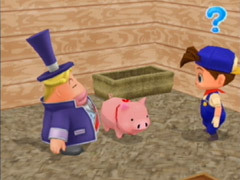 After you have built your first animal barn, go inside and you'll see a pig! The pig seems to be hiding from something, and runs once it realizes the Gourmet has found it. The pig thinks Gourmet is going to eat him! Gourmet is just kidding, and explains the pig is used for hunting rare mushrooms called Truffles. He decides to let you keep the pig. Once you give the pig a name, it'll live in your house with your dog. The pig will eat Weeds it finds on the ground if you leave it outside, so it at least has some purpose.